Kingsbury takes its name from the Old English cyning, meaning king, and burh, meaning manor. It was first referred to, in a Saxon Charter of 1003/4, as Cyngesbyrig, at which time it was evidently a royal possession. The old church of St Andrew was founded at least as long ago as the thirteenth century. It is surrounded by the remains of an early Medieval ditch. Settlement of the surrounding area is thought to have begun in the fourteenth century, after the Black Death of 1438-9. The new church, which had stood in Marylebone from 1845 to 1931, was relocated to Kingsbury in 1933, by which time Kingsbury was becoming assimilated into suburbia. Television pioneer John Logie Baird received the first combined sight and sound transmission here in 1930. Earlier, Oliver Goldsmith wrote She Stoops to Conquer at Hyde House Farm here in 1773. The old church of St Andrew was founded at least as long ago the thirteenth century, with surviving records indicating that it was administered by the Hospital of St John of Jerusalem between 1244-48. (Interestingly, there are certain indications that it is ultimately of Saxon rather than Medieval origin, including the characteristically, although not diagnostically, Saxon “long-and-short” stone-work on the quoins). The old church was extended and modified in the fourteenth and fifteenth centuries, and restored after long neglect in the nineteenth and early twentieth, by which time it had become a chapel-of-ease to the newly built nearby Church of the Holy Innocents. It was eventually closed down some years after the new church of St Andrew was built directly alongside it in 1933. In 2010, it re-opened for use as a Romanian Orthodox Church. 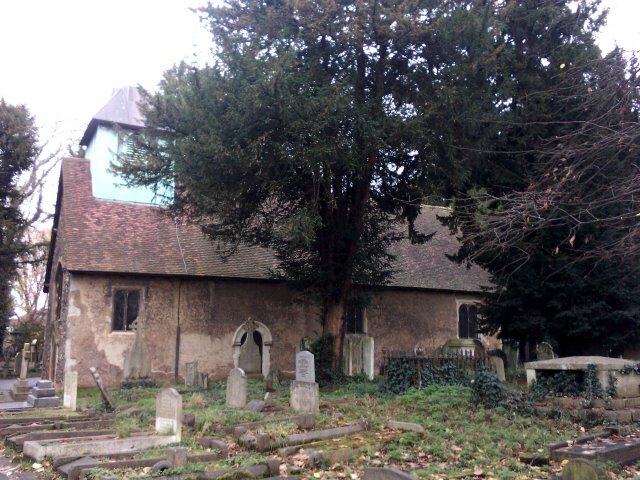 Inside the church are a thirteenth-century font, and a fourteenth-century bell that is the oldest still hanging anywhere in Middlesex. Also inside are memorials to John Shepard of Kingsbury (d. 1520), and to John Bul of Roe Green, Gentleman and Keeper of the King’s Poultry (d. 1621). This entry was posted in Far flung London on August 8, 2015 by Bob Jones - The Lost City of London.